There’s nothing that pleases a coach more than when his or her team works together as one unit toward a common goal – regardless of what the scoreboard shows at the end of the competition. 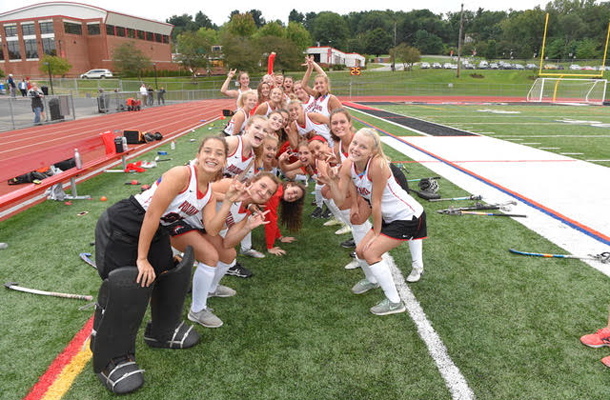 So, new field hockey coach Michelle Couch couldn’t have been happier when her players demonstrated just that during their September 27 game against rival North Allegheny High School. North Allegheny abruptly ended the Foxes season last year early on in playoffs by winning 1-0. And, to make this year’s performance even sweeter, the Foxes won 1-0 in overtime, and have continued their show of unity ever since. Among those players is senior Sydney Condron and juniors Mary Ellis, Ellie Markel, and Sloan Rost. Additionally, both senior captains – keeper Marissa Hardiman and defender Rebecca Klaas – are proving to be a great combo directing the rest of the team from the backfield. “Our defensive unit has been working on communicating a lot, applying pressure, and staying patient. 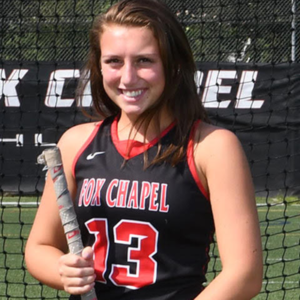 I think in the past they had a mindset of just running to the ball and trying to win it, and I’ve been focusing on us playing patient, good solid defense,” says Coach Couch, a former field hockey player herself. The girls are hoping that their unselfishness will help them reach their ultimate goal of getting to the WPIAL and PIAA championships. “Every player has her heart set on another run in the playoffs, and that motivation seems to be getting them where they want to be ­– as a team and a family,” adds Coach Couch.